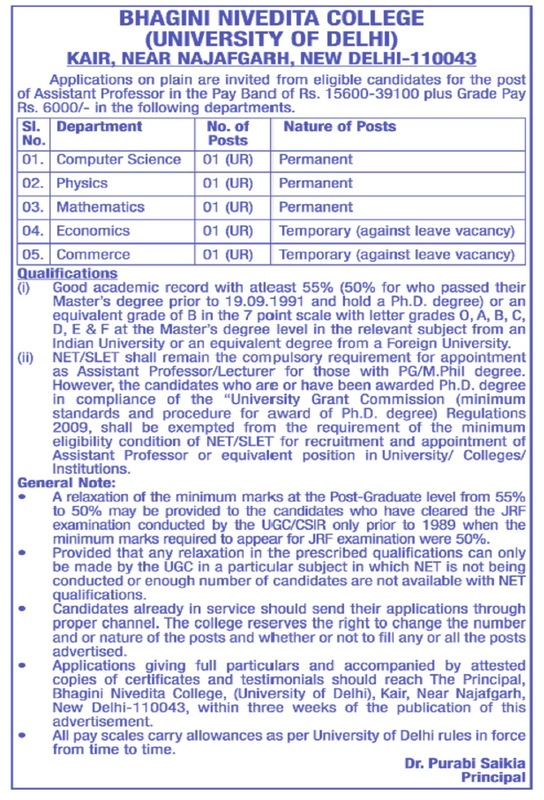 Applications an plain are invited from eligible candidates full time post of Assistant Professor in the Pay Band of Rs. 15600-39100 plus Grade Pay Rs. 6000/- in the following departments. (i) Good academic record with atleast 55% (50% for who passed their Master's degree prior to 19.09.1991 and hold a Ph.D. degree) or an equivalent grade of B in the 7 point scale with letter grades 0, A, B, C, D, E & F at the Master's degree level in the relevant subject from an Indian University or an equivalent degree from a foreign University. (ii) NET/SLET shall remain the compulsory requirement for appointment as Assistant Professor/Lecturer for those with PG/M.Phil degree. However, the candidates who are or have been awarded Ph.D. degree in compliance of the "University Grant Commission (minimum standards and procedure for award of Ph.D. degree) Regulations 2009, shall be exempted from the requirement of the minimum eligibility condition of NET/SLET for recruitment and appointment of Assistant Professor or equivalent position in University/ Colleges/ Institutions. • A relaxation of the minimum marks at the Post-Graduate level from 55% to 50% may be provided to the candidates who have cleared the JHF examination conducted by the UGC/CSIR only prior to 1989 when the minimum marks required to appear for JRF examination were 50%. • Provided that any relaxation in the prescribed qualifications can only be made by the UGC in a particular subject in which NET is not being conducted or enough number of candidates are not available with NET qualifications. • Candidates already in service should send their applications through proper channel. The college reserves the right to change the number and or nature of the posts and whether or not to fill any or all the posts advertised.